Inner silence is the key to penetrating this core of knowledge in the universe. Human beings are like onions. We have layers which are mental/emotional energetic layers within us with obscure our genuine self. As children and babies we have no layers. We are pure and unadulterated infinite consciousness. Then as we are filled with information over time, this clutters up our mind and we lose awareness of our inner truth and our natural ability of processing energy (emotional processing) is diminished or halted altogether and we start to form layers and layers of ego. Ego is our separate, individual identity that manifests itself in contradiction to our universal self. It is formed out of necessity in order to deal with all of this information/energy which we have taken in, but have not processed properly. This is directly related to our educational system, and how we have learned to live and perceive the world from our parents, teachers, the media, and basically everyone that we have met, simply by observation. To dissolve the layers of the ego over time we need only to learn to live from inner silence instead of mind. And by doing so we tap into our innate intelligence, our inner truth, and knowledge will begin to come through us directly from the field. As information comes through us the reverse happens: instead of layers forming that hold us in, our energy radiates, penetrates these layers, pushes them to the surface, and ultimately dissolves them. When we learn in this fashion we are free to learn from external sources such as books and so on, but eventually we won’t even need those and we will be able to channel all information directly from source. Which is where all books, movies, songs, works of art, and ideas came from anyway. This shift will not take hundreds or thousands of years, but will occur within a few generations … and this shift has already been underway dramatically for the past century. Just look at how the world has changed. We already see this evolution taking place right now within all individuals. The information age is occurring now just outside of ourselves, but also within ourselves. We went from print, to being able to download information (books, movies, you name it) from the internet wirelessly in a few short decades. Now in this internal information age we are also going from print to being able to download information within ourselves from the galactic internet also within a few short decades. All those alive have the potential to make this shift within ourselves if we commit to a meditative, energetic, and consciousness raising practice. 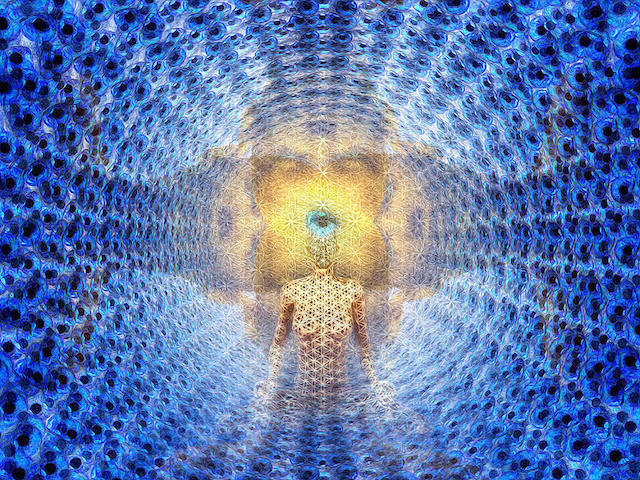 As the energetic layers of your ego are pushed to the surface and dissolved through this practice, you will find not only more intelligence, power, imagination, and stupendous learning and creative abilities within you, you will also resonate more with truth itself. Then you will become completely open to the universe, and the universe will be completely open to you, and we will be one. In order to do this, above all we must empty ourselves and become acutely aware of what is taking place within us. This is done by cultivating inner silence. When we become fixated by the idea of learning from external sources of information as the only way to learn, as we all have been to a certain degree by our educational conditioning, then we disregard the wisdom and true knowledge that is inherent within us all. There is wisdom and knowledge inherent within each of us, but in order to access it we must unlearn everything that we have learned. We must become open in order for this knowledge to become apparent to us. We do not need to read thousands of books in order to discover this understanding. Just a select few of the right ones in order to make those necessary shifts in our perception along the way. What is more important is that we embody these new perceptual understandings and experience them through inner silence. When we learn to download information from the field, what we are dealing with primarily is energy. Everything has energy. In fact, everything is energy. And within the energy of everything (from books, to music, to art, to another human being) lies encoded all information about that thing. I believe we can get to a point where we do not need to read a book, we can simply hold the book, feel its energy, and by feeling that energy we can perceive all the information of the book which is encoded within it’s energy. Much like conversations are encoded within energy to be transmitted through vacuum energy into your cellphone, the same is already true with everything. Everything in the universe radiates energy at a specific frequency and all that there is to know about that thing is encoded within that energy wave. With our technology we can detect the frequency of objects in the universe, but only with our consciousness can we interpret and decode the information within that energy. The energy of everything is radiated into the vacuum, and it is available everywhere simultaneously. To read this energy, we must become subtle through inner silence to allow these impressions to become consciously available to us. It is not a practice of working hard, because the harder we think we have to work to achieve something, the lower the level of consciousness we are operating from and attempting to manifest from. You see, we are already doing this all of the time. This is what our thoughts are. We are tuning ourselves as vibrational beings to a certain frequency with our perception, and then the thoughts that manifest within us from the infinite intelligence of the universe are thoughts which are of the same frequency as the frequency we are tuned to. To download new information from the field, tune yourself to a higher frequency.This new information will effectively give us a brand new experience of life, of reality, and it will also give us the perception of downloading information from the field because the thoughts and ideas that will come to us will be so new and truly inspiring and intelligent that we may conclude that we are downloading information from the field. But in reality we will be tapping into what was already available inside of us all along. As Bruce Lipton put it, “we are part of the field being downloaded into our minds and bodies”. We don’t realize that we are already downloading information from the field in each moment because for the most part we are operating at ordinary levels of consciousness. We are doing the same things day in and day out and we are keeping up a steady stream of thoughts that narrate our life story and the nature of our world to us perpetually. What we have to do is break that narrative with inner silence, and as soon as we open up these gaps we will find new information coming through us. Raising our vibration and downloading information from the field can therefore be summed up as a singular intention: cultivate inner silence. It is not something which we achieve, rather, it is something which we accumulate over time. Each moment spent in inner silence builds our reservoirs of inner silence which are never depleted, and which we can always access repeatedly. And the more time we spend in inner silence, the easier it becomes to access this internal state. From this place of inner silence which is really the experience of ultimate receptivity to the universe, we will over time become so empty that we will reflect the universe in all that we do and in all that we are. By seeking inner silence we do empty ourselves; we empty ourselves of all of the pettiness, anger, self-importance, and worry that defines our ego. And by emptying ourselves of all that lower energy, we become available for the higher energy of the universe. For we are vibrational beings and when we cease to hold lower energies in our bodies and minds, all that is left is more positive energies which resonate with the higher levels of energy/information in the universe and thus we manifest them. We manifest them in our minds as thoughts, in our bodies as health, and in our lives as abundance, success, and prosperity. This is the power of inner silence. As I briefly touched on in Learning from Within, one of the most important shifts in our self-image and our beliefs which we can make is to begin seeing ourselves as vibrational beings, and understanding that we are not containers for knowledge, but we are knowledge itself. The universe is defined by a collapse to singularity, and therefore everything in the universe is part of that infinite curvature. (Black Whole Dynamics) As such, everything is one. And because we are energetic extensions of this field, we are literally everything, and we have access to all information in the universe, through ourselves. Everything that we know is not stored in our brain, but within our mind-field which is non-local. Therefore it is not within us, and if we continue to go off of the assumption that the only way in which to learn anything is from an external source (a book, a movie, speaker) we are denying the most fundamental nature of ourselves and the universe. The universe is energy, and everything that we have learned is recorded in the universe by our minds as pure energy. When we recall something all that we are doing is tuning ourselves to that energy, and then it appears in our minds. Therefore if we can tune ourselves to new energies spiritually through inner silence and simply becoming available for the universe, we can tune ourselves to any thoughts, ideas, and knowledge that exist in the universe. The main principle is alignment. This is what we are doing when we sit quietly in meditation: aligning with the universe. If we could train ourselves to sit quietly every day, and refrain from the distractions of television, movies, society at large, and even the majority of our interactions with other people at least for a while, we will naturally come into alignment with ourselves and the universe. And the end result of this process is that we will clear out all of that disturbance within our mind-field and dissolve the layers of our ego, and we will channel the information, knowledge, and creative self-expression that is unique to us as an individual expression of the universe, and we will call this being ourselves. Possibly for the first time.